The Supplemental Nutrition Assistance Program (SNAP) is the largest nutritional safety net in the United States. Prior research has found that participants have higher consumption shortly after receiving their benefits, followed by lower consumption towards the end of the benefit month. This “SNAP benefit cycle” has been found to have negative effects on beneficiaries. We examine two behavioral responses of SNAP participants that may work in tandem to drive much of the cycle: short-run impatience – a higher preference to consume today; and fungibility of income – the degree of substitutability between a SNAP dollar and a cash dollar. Using data from the National Food Acquisition and Purchase Survey (FoodAPS), we find evidence of both behavioral responses. The degree of short-run impatience and fungibility of income is found to differ significantly across poverty levels and use of grocery lists to plan food purchases. Food purchase planning education could be used to counter the observed benefit cycle. Deeper analysis of the purchase data suggests that the benefit cycle is primarily associated with a decrease in the purchase of healthful and perishable foods—which could lead to lower dietary quality. 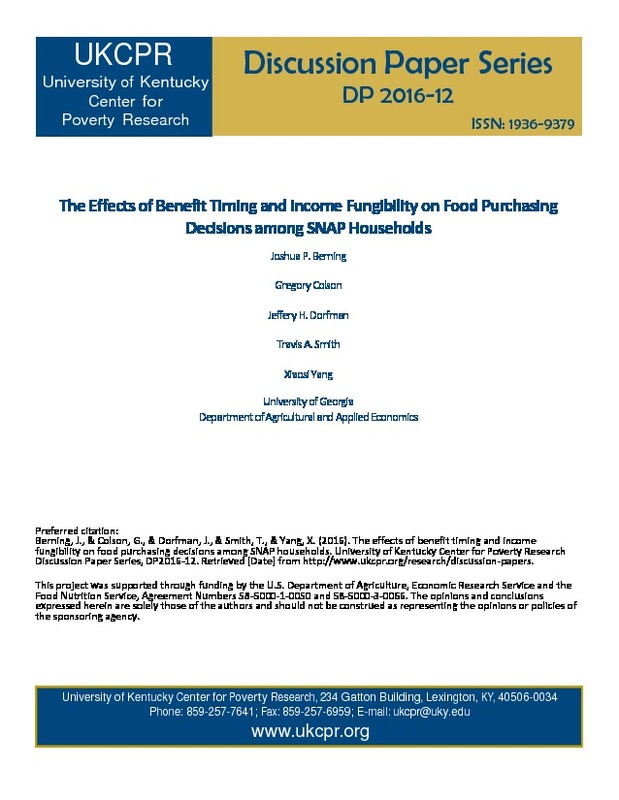 We also find evidence that suggests households compensate for the effects of the SNAP benefit cycle by acquiring free food, primarily from schools. This highlights the importance of programs like the National School Lunch Program for SNAP households.